Lovely graduation of color. So pretty. Karren, great masking and I love the graduated use of the colors. Perfect way to create interest on a one layer card. 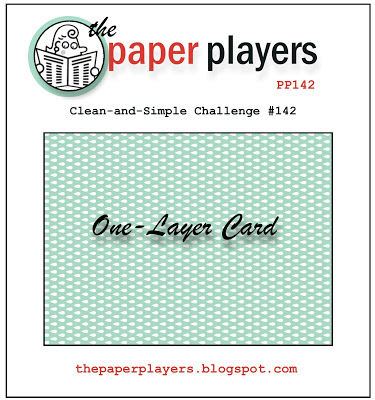 So glad you joined the Paper Players this weekand thank you for rocking my challenge. Wow Karren! I'm so jealous of how easy you've made this one layer card look so easy! This is simply amazing! Fantastic one layer card! I love the ombre effect. Very pretty! Beautiful, Karren! I love the color gradient! Such a classy one-layer card! Thanks for playing with The Paper Players! What a cool effect, Karren! Love it! Thank you for joining us at The Paper Players! Karren, I absolutely love the gradient strip on this card. You blended the colors perfectly - such an interesting look. Thanks for playing along with The Paper Players this week.